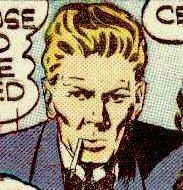 Powers/Abilities: Henry Sanders a man in his 60's did not possess any revealed superhuman powers. He was remarkably fit and agile for a man his age and was an expert in Egyptian archeology and a competent explorer and businessman. He used an ancient Egyptian style dagger. (Captain America Comics#8/1 (fb)) - Henry Sanders while in Egypt discovered a tomb of an unknown Pharaoh near the mouth of the Nile River. 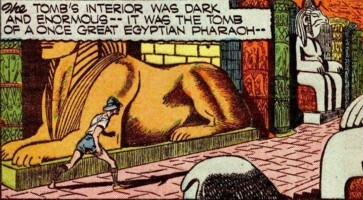 Exploring the darkened interior, Sanders came upon the Pharaoh's burial chamber that contained his mummy case which was designed to look like the god Ra. The mummy case was adorned with a great glistening ruby that was situated between its eyes. Not heeding the warning of sudden death that was inscribed on the mummy case, Sanders removed the ruby and departed the tomb. After a few years, Sanders now in the USA, sold the Ruby of the Nile to Mr. Bates and his business partner Mr. Parker explaining his desire to be rid of it due to its curse that had dogged him since finding it. 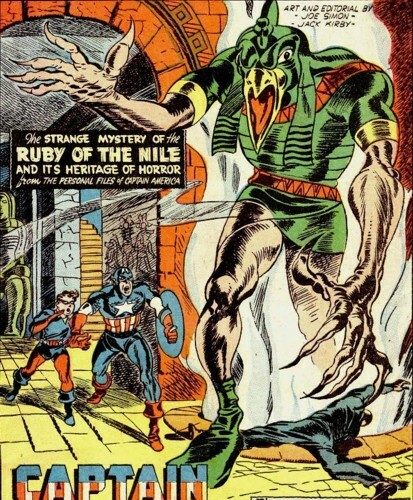 (Captain America Comics#8/1 - BTS) - Either via the ancient curse or his own madness and greed, Sanders took up the identity of Ra the Avenger and set out to murder anyone in possession of the Ruby of the Nile. (Captain America Comics#8/1) - While Mr. Bates was alone in his room and contemplating cutting the ruby up into smaller gems, Sanders now dressed as Ra the Avenger, entered the room in a great burst of smoke. He accused Mr. Bates for defiling his tomb and proceeded to strangle the man and then ultimately stabbed him to death with an ancient Egyptian knife. The resulting screams alerted his daughter Marina, her friend Betty Ross (who was visiting) and Mr. Parker and much to their horror discovered Mr. Bates dead body. Betty Ross decided to investigate the murder and soon after both Captain America and Bucky join the case. Later in the evening Sanders attempted to steal the Ruby of the Nile while turning the power off to the house but Captain America secretly grabbed it away and quickly departed the room. Sometime later that evening, Sanders, once again clothed in his Ra the Avenger identity murdered Mr. Parker who had been ordered to produce the ruby for him but was unable to since it no longer was in his possession.. The struggle is witnessed by Captain America and Bucky who then chased him outside and into the garden where he was able make his escape. 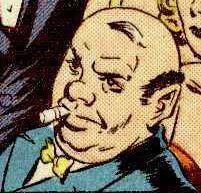 Returning to the mansion as Mr. Sanders, he is later questioned by Betty Ross and briefly turned her back to him to speak with an FBI contact on the phone. Once again Henry Sanders becomes Ra the Avenger and attacked Betty Ross fearing that she had learned the truth about him being the murderer. Captain America, who was watching nearby, entered the room in time to save her from Ra's imminent attack. A vicious battle ensued but Captain America eventually gained the upper hand and rendered Ra unconscious when a quick and precise punch landed and knocked him across the room. Ra was unmasked and revealed to have been none other than Henry Sanders much to their overall surprise! Presumably, he was then taken away by the FBI or the local police to face trial for his crimes. It was not made clear if Henry Sanders possessed any superhuman powers and abilities that came about when he took the Ruby of the Nile from the tomb. I would seem to think he was either granted powers via the Ruby and went insane or the ruby transformed him into Ra the Avenger via possession from the unknown Pharaoh into the earthly avatar of the Egyptian (with no control over his transformations) sun god as a means of protecting the gem from being possessed by others. If the latter is the case then he may not have been aware that he had murdered anyone. He appeared to be a man in his 60's and by no means should have been able to fight Captain America toe to toe let alone out run him without having some sort of enhancement. When he was in his Ra persona, Henry Sanders appeared physically taller and muscular compared to his typical elderly self. It is possible he possessed some degree of superhuman strength and endurance but unfortunately this was not confirmed in the story. He also seemed to have long talon like fingers on his hands that could be used as deadly weapons. Remarkably he seemed to be able to quickly appear fully clothed in his Ra the Avenger costume almost instantaneously. 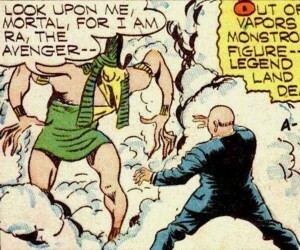 He may also been able to produce a thick blinding and choking smoke whenever he transformed into Ra the Avenger. It is unknown what actual role that the god Atum may have had regarding the Ruby of the Nile. Could Atum have fabricated the Ruby as a gift to the Pharaoh for his devotion or was it created simply to honor him? The name of the Pharaoh was never identified and although I am not an Egypt expert I believe the best candidate would be a little known King named Raneb (or Nebra) that translates into English as "Re is the Lord" or "Lord of the Sun". Not much is known about this Pharaoh other than he ruled during Egypt's 2nd dynasty (3150 BC to 2686 BC) and may have been the first to openly worship a sun god and which later had a very important impact on much Egypt's culture and history. Ra the Avenger's unusual agility and fitness is the result of the Ruby of the Neil (a gem I call the Ruby of Ra because it was removed from a carving of the Egyptian Sun-God Ra on the Pharaoh's Sarcophagus). I say that his costume could be Horusian technology and like the Vulture's Electromagnetic Harness it enhances his strength,agility and vitality. My inspiration from Alien Technology is Golden Age hero the Ace of Space and World War Hulk:Gamma Files---under the Horusians (it says something about their life-like masks). This large ovoid gem dubbed the Ruby of the Nile was the centerpiece to the Pharaoh's mummy case and was positioned between the eyes of head that was designed to look like a representation of the Egyptian god Ra. Supposedly the gem was cursed and would bring instant death to any who possessed it. The Ruby was taken by Henry Sanders who after a few years decided to sell it to Mr. Bates and Mr. Parker. Sanders dressed in the guise of Ra the Avenger and murdered both men in an attempt to reclaim it. 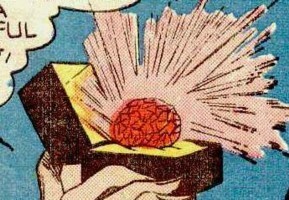 The Ruby of the Nile was later given to Marina Bates after Henry Sanders was captured by Captain America. The tomb belonged to unknown pharaoh predating the pyramids of Giza and was discovered in the late 1930's by Henry Sanders near the mouth of the Nile River. The burial chamber contained a mummy case in the shape of the Egyptian god Ra and was adorned with the Ruby of the Nile. Marina was the daughter of Mr. Bates who co purchased the Ruby of the Nile from Henry Sanders. She was friends with Betty Ross and had invited her over to see the great ruby. 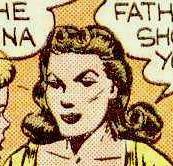 After her father's and Mr. Parker's murders and subsequent capture of Henry Sanders at the hands of Captain America, the Ruby of the Nile was given to her. He was the Marina Bates father. Mr. Bates and his partner Mr. Parker purchased the Ruby of the Nile from Henry Sanders who had acquired it from a tomb in Egypt.. Mr. Bates debated with his partner about cutting the ruby up into smaller gems and reselling them for a profit and was adamantly opposed to this and locked the gemstone inside a wall safe. Henry Sanders, later in the evening, murdered Mr. Bates in his office with a knife while dressed as Ra the Avenger and failed to steal back the Ruby of the Nile. 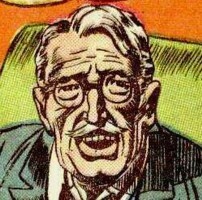 His murdered body was soon discovered by his daughter (Marina), Betty Ross and Mr. Parker who were all shocked by the horror. Mr. Parker was Mr. Bates' business partner and co purchased the Ruby of the Nile from Henry Sanders. Mr. Parker believed that the ruby should not be cut into smaller gems and would be more valuable as a whole. He was murdered by Henry Sanders dressed as Ra the Avenger in his attempt to steal back the ruby. Biggs was employed as Mr. Bates' butler and served his guests drinks while the Ruby of the Nile was being discussed. Later, Biggs was briefly questioned by Captain America if he had seen where Ra the Avenger had fled to after murdering Mr. Parker. Biggs was briefly present when Betty Ross began questioning Mr. Sanders but after serving him a cold drink of water was told to leave the room but stay with in call.